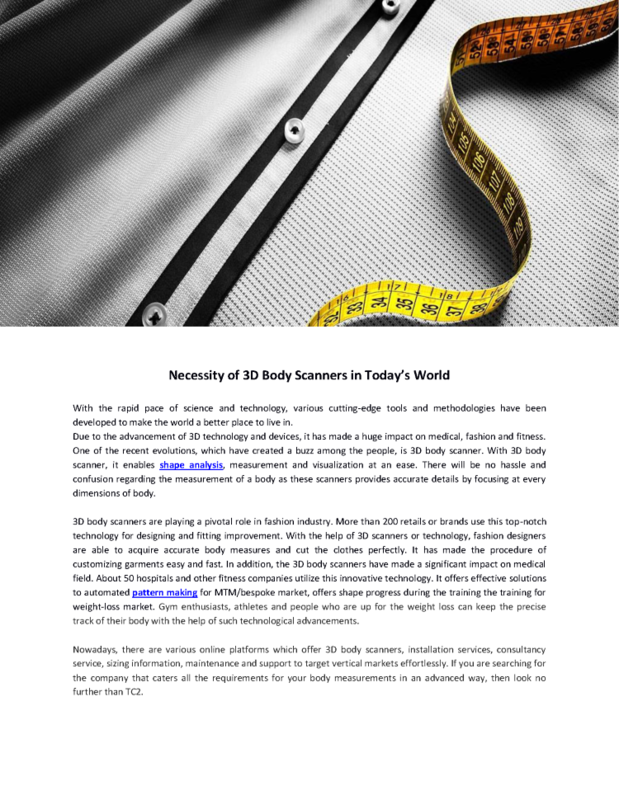 Necessity of 3D Body Scanners in Today’s World With the rapid pace of science and technology various cutting-edge tools and methodologies have been developed to make the world a better place to live in. Due to the advancement of 3D technology and devices it has made a huge impact on medical fashion and fitness. One of the recent evolutions which have created a buzz among the people is 3D body scanner. With 3D body scanner it enables shape analysis measurement and visualization at an ease. There will be no hassle and confusion regarding the measurement of a body as these scanners provides accurate details by focusing at every dimensions of body. 3D body scanners are playing a pivotal role in fashion industry. More than 200 retails or brands use this top-notch technology for designing and fitting improvement. With the help of 3D scanners or technology fashion designers are able to acquire accurate body measures and cut the clothes perfectly. It has made the procedure of customizing garments easy and fast. In addition the 3D body scanners have made a significant impact on medical field. About 50 hospitals and other fitness companies utilize this innovative technology. It offers effective solutions to automated pattern making for MTM/bespoke market offers shape progress during the training the training for weight-loss market. Gym enthusiasts athletes and people who are up for the weight loss can keep the precise track of their body with the help of such technological advancements. Nowadays there are various online platforms which offer 3D body scanners installation services consultancy service sizing information maintenance and support to target vertical markets effortlessly. If you are searching for the company that caters all the requirements for your body measurements in an advanced way then look no further than TC2.